Ingredients for Dosa: Rice 4 cups, 1 cup Urad Daal, 1 tea spoon Fenugreek seeds ( Methi), ¼ tea spoon Turmeric powder, Salt to taste, Oil or Ghee, Water. Method: Soak Rice and Urad daal separately for about 4-5 hours. Soak Fenugreek seeds with Rice. Grind the soaked ingredients in thin paste. Add salt, turmeric powder with water to make batter and keep aside for 6 to 7 hours. Heat pan or griddle with little oil or Ghee. Spread the batter on pan in circular motions to make thin dosa. Cover with a lid for half a minute. Add a little oil or ghee on the dosa. Fry till golden brown. Dosa is ready. Ingredients for Masala: 2-3 Medium sized potatoes, 1 Medium size Onion, 3-4 Green chillies, ¼ Tea spoon Turmeric Powder, Salt to taste, 1 table spoon Oil. Method: Boil potatoes and cut in small pieces. Cut the onions in small pieces. Then heat oil in a deep pan, add chopped onions and fry. Add chopped green chillies and turmeric powder. Once the onions are golden brown add potatoes and cook for 2-3 minutes. Add salt to taste. Do not add water as the masala should be dry to be filled in the Dosa. 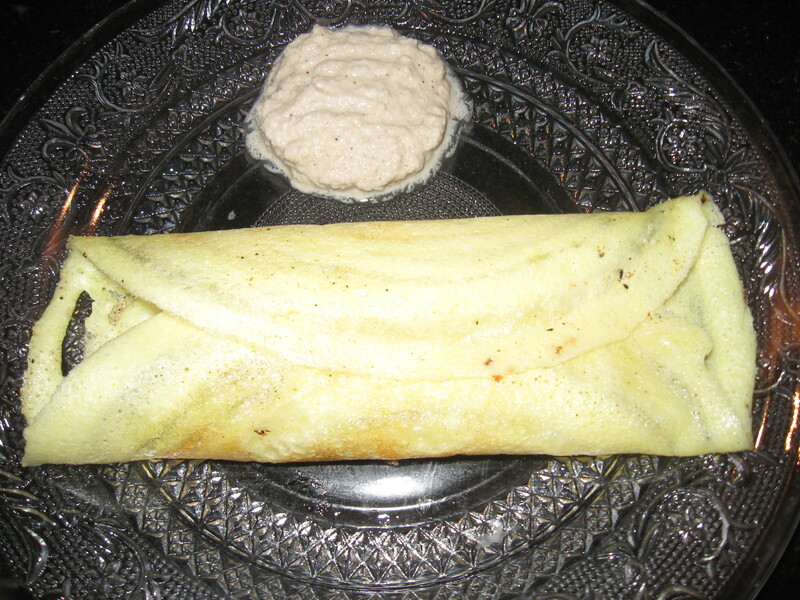 Once the dosa is golden brown add the filling on the dosa (Only in the middle) and fold the dosa from both the sides. Serve hot with coconut chutney. Method: Fry green chillies for a minute and then grind all the above ingredients adding water as necessary to a paste. Chutney is ready.